Originally in Asimovs June 2001. I read the original in the Peanutpress version on my PDA, and only found out some time later that the print version used back-to-front narrative to ‘rewind’ the action whenever Mada when back in time (‘skipping downwhen’). This simple technique does in fact add a lot to the story. Michael Blumlein. Know How, Can Do. Originally in Fantasy & Science Fiction Dec 2001. Richard Wadholm. From Here You Can See the Sunquists. Originally in Asimovs, January 2001. Robin Wayne Bailey. Keepers of the Earth. The first in the volume which I hadn’t read. Humanity has fled Earth, leaving it a charred cinder. Over the millenia a single robot builds others, who themselves build others, and nanobit by nanobit Earth is returned to its former glory. But when humans look to return, how will the robots welcome them? The story felt a little ‘retro’, more in keeping with golden age SF than contemporary SF. A nice read, but not brilliant. The moon is found to have shifted ahead of its orbit. The scientists of the world are bemused, until one suggests an explanation. The nature of the explanation, and its implications for the future of Earth are worrying. Ian Watson. One of Her Paths. Originally in F&SF Oct/Nov 2001. “Now this is more like it! (The previous stories had been less than brilliant). Tau Ceti is the destination for the first crewed starship, Pioneer, using the new Q-drive to undertake a journey through probability space. Allen Steele’s ‘Coyote’ series has over the past year in Asimovs been taking us through a deep space colonisation tale, but this at once is different. Written in the present tense (present imperfect I think, but grammar was never my strong point) is a little unsettling, and feels perhaps gimmicky. We see the journey through the eyes of Dr Mary Nolan, and until the crew members strap themselves in for the leap through ‘probability space’ everything is pretty much as you would expect. The quantum nature of the vessel impacts in a huge way when Q-insertion takes place. Dr Nolan finds herself alone in the ship. The infinite variations of quantum science has meant that there now a multitude of individual Probe’s, and she faces six months alone before the ship drops out of Q-space. Whereas in Steele’s Coyote series one crew member unfrozen in the course of the journey goes barking mad, Dr Nolan very much becomes one with herself, and with a larger ‘something’. When the ship is re-combined in normal space, the crew are brought back together. However, one pregnant crew member has given birth, and the child is very much different. Michael Swanwick. The Dog Said Bow-Wow. Originally in Asimovs Oct/Nov 2001. Nancy Kress. And No Such Things Grow Here. Whilst I only gave one quibble in the review, I didn’t make a point of praising the story, and I would certainly rank it below stories in the same throbbing issue such as Charles Stross’ ‘Lobsters’ and Andy Duncan’s ‘The Chief Designer’! Baxter once more gets into the mind of a non-human being. In this case a far-future creature of minute proportions, who manipulates time its very self to find an answer to the biggest questions. Originally in Asimovs Sept 2001. Not a story which I would have put forward for a Top 11 of the year! Dan Simmons. On K2 with Kanakaredes. There have been several mountaineering stories over the years, and in this one an extra-terrestial from the race known as ‘The Listeners’ joins a climb up the dangerous K2. In the process of the climb and the fatal descent, more is learnt about the aliens and the humans. Neatly told, but not earth-shattering. So – what to make of Silverberg’s entry into the year’s best anthology market? Firstly, praise for getting the book out so quickly! Although there are some reservations as to what this means for the collection policy. 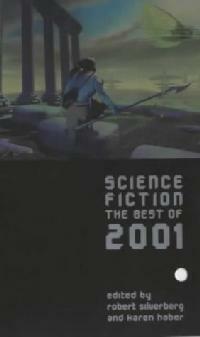 Certainly the December 2001 issues of Asimovs, F&SF and Analog will have been within the frame for choosing stories. But the December issue of Interzone? Secondly, the book is deceptively chunky (almost 500 pages), but there aren’t that many words on each page! And the margins of the pages go quite close to the spine, requiring the book to spread quite worryingly wide to read to the end of the line on left-hand pages, and the beginning of the line on right-hand pages. Thirdly, in terms of sources – Asimovs, F&SF and Analog are well represented. Interzone and Spectrum SF aren’t at all – which is particularly galling as Ian R. Macleod’s ‘Isabel of the Fall’ from Interzone is a glaring omission IMHO. Fourthly, in terms of stories – I would certainly agree with seven out of eleven of the stories. However, for me the Bailey, Benford, Kress, and Grimsley would be behind any of the following! But, all in all, not a bad collection!